You ain’t no basic b***h.
Basics are like your best mate. Always there, always a good time. A real no fuss, no problems relationship. A basic tee actually works harder than you’d expect. Let me explain; they’re an easy way to keep you looking fresh, as they work with everything you could possibly want to wear. They allow you to be a bit more daring with your other combined elements, like pants, shoes or man accessories. If you’re keeping it simple up top, you can be more detailed elsewhere. Get me? 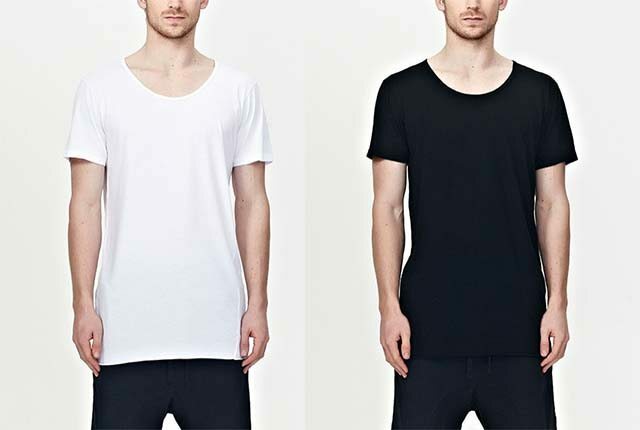 Stocking up some on some basic tees is a good move. I’ve managed to find a variety of basics that i’m liking and the best part is they’re all from one neat Kiwi label, Commoners. They’re all about the classic wardrobe staples that in their words, are clothes that will feel like your newest old favourite. While you can’t touch the fabric over the internet (real shame that) you can trust me that there’s something earthy about this jersey cotton blend. I’ve had a look through their range at their flagship store and the thread feels organic in construction and crafted with a slight rawness around the edges they make for a tee that’s unrefined and natural, a bit like you and me. From your standard neck tee to a scoop lower neckline, it’s a steller line up of tees for all tastes. Check out the full range from Commoners. You can never be too basic. A lower scoop neckline really suits a more hirsute chap, like Nick Dellabarca, for instance. Got to show those chest hairs, they’re impressive.